Teresita Villasenor was working 12 hours a day, seven days a week, for 18 months straight. “I felt like I was a slave,” she told The Huffington Post regarding the job she quit in 2014. Villasenor is from the Philippines and has been working as a caregiver in the U.S. for the past five years. She is one of thousands of domestic workers in California fighting to make overtime laws for caregivers permanent in the state. The California Bill of Rights currently protects overtime pay for personal attendants, such as nannies and caregivers for seniors or the disabled. But there’s a hitch: when the law was passed in 2013, it was signed as a provisional law, which means it will expire in 2017 unless a new law is passed by September. On Friday, the California Domestic Workers Coalition launched a campaign to make overtime pay for domestic workers permanent in the state. “The dignity of domestic workers isn’t a provisional right — it is something that should be a permanent condition,” said Katie Joaquin, campaign director for the California Domestic Workers Coalition, to the Huffington Post on Friday. The campaign will mobilize domestic workers statewide on a monthly basis to engaged in press activities, rallies and other actions until Gov. 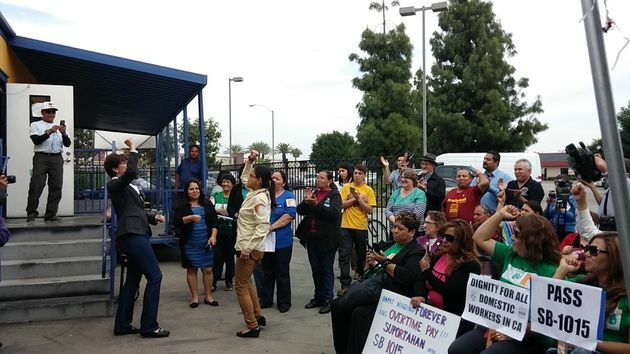 Brown signs the new bill, which Senator Connie Leyva introduced last month, to make overtime protection permanent. In California, there are over 300,000 domestic workers, according to a press release from Sen. Connie Leyva. Most of these workers are immigrant women. Nationwide, 95 percent of domestic workers are women, according to a 2012 national study of domestic workers. 54 percent were women of color, and 46 percent were immigrants. In California, 90 percent of domestic workers who worked overtime did not always receive overtime pay, according to a 2007 Household Worker Rights Coalition Survey. Rather than giving workers a firm schedule, employers will often have an on-call arrangement, particularly for workers who live in the home, elaborated Joaquin. When work expectations are not laid out, workers are not able to live their own lives, be with their families, and do things they want to do on their own time. Even if the new overtime bill is signed into law, that’s only half the battle. After an overtime law took effect in New York state, for instance, just 15 percent of parents surveyed actually paid their nannies overtime, according to the Nation. To enforce the law, a worker would have to bring a lawsuit against their employer or file an administrative claim with the California Division of Labor Standards Enforcement, according to the California Domestic Workers Coalition. An alarming 91 percent of workers who encountered problems with their working conditions did not complain, because they were afraid they would lose their job, according to the 2012 study. What’s more, 85 percent of undocumented immigrants who encountered problems did not complain because they feared their immigration status would be used against them.